Great tent overall. Easy to set up, only two poles which are easily and securely attached to the tent. I experienced two different rainstorms in two weeks in this tent and never had a single worry. I had the tent placed on top of a tarp, so i'm unsure how it would handle a wet environment without extra floor protection. Tent was vented well, the front and back window are easily accessible and the rain fly provides weather protection even when the windows are open. The front also provides extra storage space under the rainfly (enough for a cooler and a couple chairs keeping them dry). Inside storage is great, came with a hanging net shelf in the ceiling that can handle a good amount of weight, and the side pockets provide some extra out of the way storage. I used this tent consistently last summer on both camping trips and attending a few music festivals. I saw friends tents crumble under use and weather, I never had a problem. This tent has stood up to some rough handling as well, as I'm not the most responsible caretaker of my tents. This was my second Eureka! tent purchase, as I really love the first one. We purchased the Eureka! Tetragon 7 last minute from Campmor for a Halloween weekend camping trip, car camping at a camp ground. We received it in time to set it up indoors before packing for the trip. I am so glad we did. The weather report changed on the day before we were to leave. We packed our truck and trailer in light rain. When we got to the campsite to set up, it was raining heavier with snow mixed in. Still, we set camp because the weather the next day was supposed to be really good. We were able to quickly get the tent set up with very little rain getting in before we attached the fly. It withstood rain well into the night. Luckily, there wasn't any wind, so we didn't have to deal with that, too. No water got into the tent. Boots were left outside the tent under the protection of the fly and stayed dry. A dog slept inside the tent with two boys. No damage from his nails to the floor. Yes, the poles could be better, but both tents can be backpacked and are light weight. Therefore, to have sturdier poles, weight would be added. With my first Eureka tent, the poles broke after a few used, but I fixed them on site (needing a place to sleep) and haven't even ordered replacements yet. All in all, the weekend went well despite the rain — which did not return after the first night — and temperatures — both nights were below freezing with the second night in the low 20's — we had an excellent weekend. 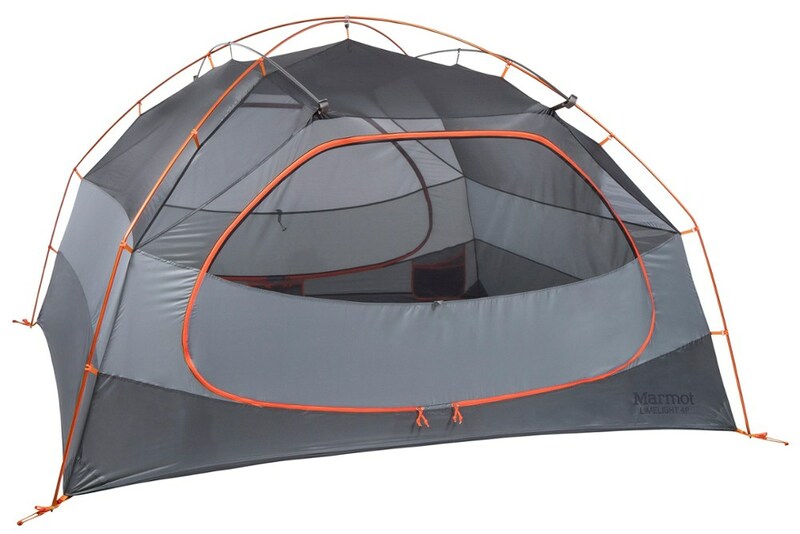 Overall this tent is an excellent value and I recommend it. It performed well on a 45 day trip across the US from state parks, the Badlands, backcountry Yellowstone and (in a pinch) the occasional KOA. The rainfly is seam sealed from the factory, as is the bathtub floor. The tent held up to downpours and overnight hail in Yellowstone without letting in a drop of water (except for a small amount that came through an unzipped window- our fault). There are huge mesh walls on two sides which allow for great cross ventilation. The gear loft is convenient (though I'm not sure how strong) and there are 2 internal side pockets that allow for easy stashing of flashlights, etc. On the downside there is not much room under the rainfly outside to stash gear. Realistically you may be able to fit 2-3 pairs of boots near the door to protect them from rain but that is all. The rainfly does not completely close around the front and rear of the tent and while this was not an issue with the rain, it would be a problem if you had 4 people plus gear to stash. Also, as other reviewers have stated, we had our front and rear small poles snap as well. The poles keep the rainfly fully guyed out over the door and rear window. The tent was completely pancaked in the Badlands during an intense windstorm which I think was a significant factor leading to the breaks- and which could have been prevented by sufficiently guying the rainfly. In our case we were able to rig the rainfly to trees to keep the rain out. After 30 continuous days of use, we expected wear and tear. Also, the poles are graphite and won't last forever. In the end I gave it 4 stars. Like I said, great value for $80. If you want a tent that will last for 20 years without replacing poles, you're in the wrong price range. The 3-segment shock corded poles ("brim rods") that cover the front and rear brow have broken twice when installing them. I followed the instructions carefully but even with great care and caution the bending stress is too great and they snap at the ferrule. The first pole was replaced when I called customer service and a 5 segment repacement was sent immediately. It works fine. When the second 3 segment pole broke they agreed to honor the warranty only after I sent the broken part back to them. The shipping cost was more than a repair kit from an outdoor store so I elected to fix it myself. There is an obvious problem with the 3 segment pole and they ought to replace them with the 5 segment alternates without making one jump through hoops. Ergo the single star. 1st it was easy to setup, 2nd only two slept in this tent, not sure if there would be room for a 3rd person with sleeping bags etc. (sleeps 2 very nicely). I'm 5'11 add a sleeping bag and the bag touches the tent wall causing the feet end to get damp (tent condensation?). 3rd I was able to stand slightly bent to get dressed. If I had to do over I would get the 4 person tent. 4th the hooded fly over the front and rear door windows are GREAT! I own the older version of the tent, and have never had any problems with it. Our Boy Scout troop also owns 2 of the older versions and only real issue is the tent bag. It doesn't hold up to much wear and you can't buy replacements. About 2 years ago the troop bought 3 new versions of this tent (I prefer the old style). On the first campout 2 of the rods broke. It was a little windy that day, but all the older tent rod were fine. The rods seem to be too brittle. They wouldn't replace the rods because they said it was wind damage, but they were pretty cheap, so I just ordered replacements. One of the original rods has broken since the initial outing. 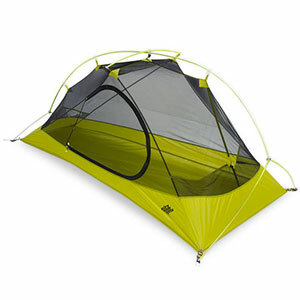 You can backpack with this tent, since it sleeps 2 people very nicely with plenty of room. All in all a very good tent for the price. I purchased this tent via the internet and could not be more pleased with it. It was extremely easy to set up and is very spacious. I have performed zero waterproofing or seam sealing techniques and have not had a single problem with water besides the normal condensation that anyone would encounter. The only problem I have had with this tent is that one of the mini-polls used to prop up the rain fly from the back window broke after about the 10th time I used it. I have not researched replacement poles but I would assume the are inexpensive. 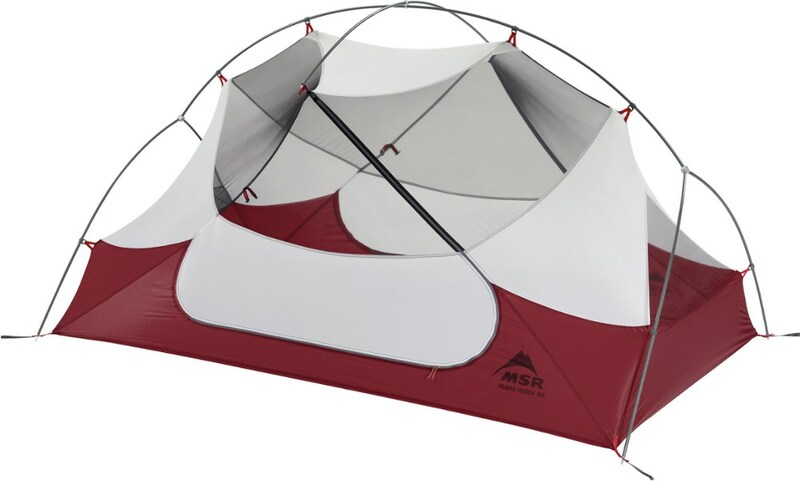 Overall, this is a great tent and I look forward to using it on my thru-hike of the Long Trail this summer! I have the older design Tetragon 7 made in 2002. It is basically the same except the newer models added clear windows and a floor skirt to wipe your feet on before entering the tent. My older tent is also before Eureka starting factory seam sealing their tents. The current tents have factory sealed seams. 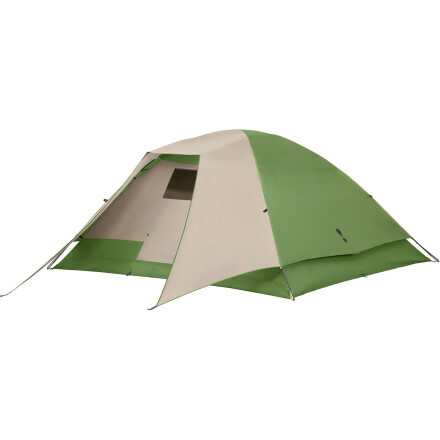 Overall, these are great tents and especially for the money. It is well thought out, good materials, good ventilation, and again for the price you pay, well worth it! I am a FIRM believer in seam sealing your own tent with McNett Seam Grip before you start using it, especially the floor seams and the fly. Even if it is factory seam sealed I highly recommend doing this. Read other reviews and you will see what I mean. The five or six times I have been in the rain before sealing it up, it leaked at the corners of each floor, slow leaked thru the fly where the velcro was attached, and a few other seams. I was very disappointed. Again though, my 2002 tent had NO factory sealed seams and I had not applied seam sealer myself. Once I seam sealed all the floor corners inside and out as well as the fly, it is a wonderful, dry, and dependable tent! I went through one heck of a squall line thunderstorm with high winds one night in the Smokey Mountains in 2003. It weathered it quite well and I stayed completely dry. 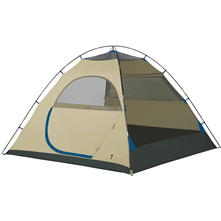 It is perfect for a backpacking or canoe/kayaking base camp tent for one person or two and you will love the extra headroom. I have always thought the larger versions of these would make great family tents as well. The design tells you something good because these tents have changed very little over the years in overall design. The only downside is that Eureka continues to not make footprints for their tents so find you a tarp or plastic! When I bought this tent I did not know what to expect. When I bought this tent I did not know what to expect. I had never bought a tent and I heard Eureka was good. When I got it I was amazed at how simple it was to set up. Before I used it I put seam sealer on it. The first time I used the tent it rained all night. It did not leak at all. But as with all tents condensation can build up. Then just a week ago I went camping with a friend out into the middle of the prairie and an extremely severe storm blew through. I was confident the rain would stay out if the wind did not flatten the tent. Unfortunatly we had 60 mph wind gusts and it did flatten the tent. But there were no puddles from leaking. I conclude this tent will withstand the hardest rain but in wind over 35 mph stay home! The Eureka! Tetragon 7 is not available from the stores we monitor. It was last seen December 10, 2012	at Campmor.